President Obama has brought to the forefront the issue of taxes as a major part of his economic stimulus package. With that in mind, I thought it appropriate to discuss some of the tax issues that face covered call writers. First and foremost, let me state the obvious: I am not a tax expert. However, I do make every effort to be as informed as possible on issues that effect my hard-earned money. This article is a brief and highly simplified introduction to the tax issues, not tax advice which should be addressed with your attorney, accountant or tax preparer. Under the current IRS regulations, both stock and stock options are considered capital assets, and any gain on their sale is taxable. If the stock or option is held for less than a year, then short-term capital gains (STCG) apply. This rate would be your ordinary income tax rate up to 35%. If the stock or option is held for at least a year, the gain is taxed at a long-term capital gains rate which is 15% for taxpayers in the 25%, 28%, 33% and 35% tax brackets. For stocks, holding periods can be affected when selling deep in-the-money strikes. This discussion is beyond the scope of this article and consultation with your tax advisor is appropriate. Since we sell predominantly 1-month options, short-term capital gains rates would apply in all non-sheltered accounts. As a matter of fact, most stock options have a duration of nine months or less, so tax rates will usually be at the short-term rates. The exception to this rule are LEAPS. These are options contracts with expiration dates that are longer than one year. Structurally, LEAPS are no different than short-term options, but the later expiration dates offer the opportunity for long-term investors to gain exposure to prolonged price changes without needing to use a combination of shorter-term option contracts. The premiums for LEAPs are higher than for standard options in the same stock because of increased time value as the later expiration date gives the underlying asset more time to make a substantial move and for the investor to make a healthy profit. This is an increase in the value of as capital asset, such as a stock or an option, that gives it a higher worth than the purchase price. It must be claimed on income taxes in non-sheltered accounts. 1- An expired option ( we sold the call, we didn’t close the position by buying back the option and the holder did not exercise the option) results in a short-term capital gain. For example, we sell an Apple April 90 call for $4.50 in March. The proceeds are $450. Since the cost is $0, the short-term capital gain is $450. The acquisition date will be LATER than the sales date and the word “Expired” should be written in column e, the cost basis column. 2- If we buy back the same option in the above example to close the position (usually to invoke an exit strategy), the difference between the sale profit and the buyback cost will represent a capital gain or a capital loss. As in example 1, above, the acquisition date will be LATER than the sales date. 3- If the option is exercised, the option transaction becomes part of the stock transaction. The option premium is added to the strike price received, less commissions. If the stock has been held for less than one year, the entire transaction will be treated as short-term. If the stock had been held for one year or more, the entire transaction will be treated as long-term as the option holding period is ignored. The specific information referenced above can be found in IRS Publication 550 entitled Investment Income and Expenses, pages 57 – 58. Many thanks to Owen Sargent, an outstanding CPA and seasoned stock market investor, for his assistance with this portion of the article. 1- The Conference Board’s index of leading economic indicators was down 0.4% for February. This is a near term gauge of economic performance. 2- Industrial production was down 1.4% and factory output fell 0.8%. The industrial base is on track to post its worst quarterly performance in 30 years. 1- The Fed announced its plan to purchase $1 trillion in long-term U.S. Treasury and mortgage-backed securities in hopes of energizing the housing industry. 2- New residential housing construction was up 22% in Februay and permits for future construction rose 3%. 3- Inflation appears to be in check as the Consumer Price Index (CPI) was just 0.1% above where it stood one year earlier. For the week, the S&P 500 was up 1.7% for a year-to-date return of -14.3%. I have asked my web team to enhance this site based on many of your great suggestions. In particular, I’ll be working on expanding the media library especially since I’m more comfortable working with my webcam and uploading to YouTube (not a strength of mine). I welcome all comments and suggestions in this regard. Finally, many of you have asked about my new book. Significant progress has been made but there are a few changes I need the publisher to make before I give my final approval. When you see all the charts and calculations, the challenge will become crystal clear. We’re only weeks away. I’m completely new to this but so excited after reading your book. This weekend I went through the IBD list for the first time. I picked 5 stocks. Can you tell me how I did. Thanks for any help you can give. Here they are. You are doing absolutely great! 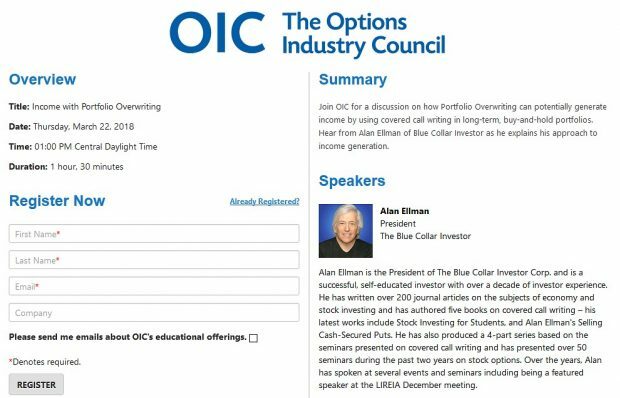 Welcome to the world of Blue Collar investing. You selected 5 great performing stocks…congratulations. For a slightly tricky reason one of these actually does not belong on our watch list. Let’s see if you or a fellow BCI can figure it out (hint: see chapter 12 of my book). If no one resonds, I’ll post the answer tomorrow. FDO is on the list of stocks that report same store monthly sales. Reporting monthly same-store retail sales represents a similiar risk as do earnings reports and that’s why the stocks on this list are ‘banned” from consideration for selling cc options. After an incredible up-day today, there are a few things I consider if planning to sell a cc tomorrow. First I try to locate a stock that didn’t appreciate dramatically today. One that went up slightly would be one of my top choices. Then I would look for a stock whose price is between 2 strikes rather than near a strike. The reason for this is that although the last two weeks have resembled a bull market, the overall tone is still that of a bear market and I-T-M strikes would be my preference. We are guaranteed a 1-month return of 2.6% as long as our shares do not decline in price by more than 3.3%. Of course all calculations need to be re-checked prior to making any trades. We are guaranteed a 3.4% 1-month return as long as our shares do not depreciate in value by more than 2% by April 17th. On Monday I bought qsii for $44.50. Then I sold the 45 covered call option. Today the stock is around 47.50. Sould I buy back the option and why? Thus far, this investment is making you look like a genius! I would not buy back the option at this time. You originally sold an O-T-M strike which has only time value. Now, with the price of the stock above the 45 strike, the option premium has both time value and intrinsic value ($2.50 per share). You would be paying more to buy back the option than the original option sale. Since this is not an expiration Friday exit strategy, this is not money well spent. View this as you made a great 1-month profit on the option sale, perhaps another $50 per contract on the stock appreciation and currently $250 in downside protection. On or near expiration Friday, evaluate for a possible roll out or roll out and up if the share price is still above the strike. Having a strong watchllist is the backbone to successful investing and maximizing returns. From time to time we will hear a financial term that we are not familiar with. One of the weeknesses of stations like CNBC is that they speak to seasoned investors who live the Wall Street life. Too often, these terms are not defined or explained. You may want to bookmark this site and have easy and quick access to financial terms. Whenever I find a site, particularly a free one, that can facilitate our investment strategies, I will publish it on these comments links of my most recent article.